Toronto is in the midst of an unprecedented strike by over 10,000 Teaching Assistants (TA) and contract faculty at York University and the University of Toronto: the country’s two largest universities. 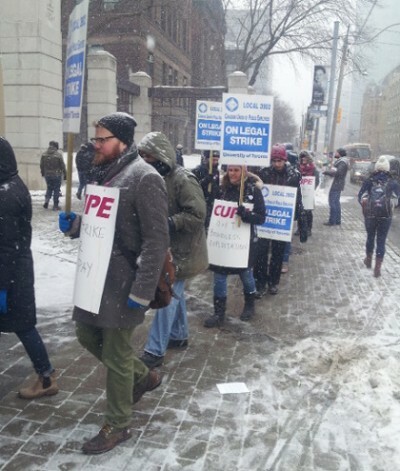 Only blocks away from the University of Toronto picket lines, the Liberal government in Queen’s Park has been waging a war against the Ontario Public Service (OPS), represented by OPSEU, raising the prospect of the first OPS strike since 2002. 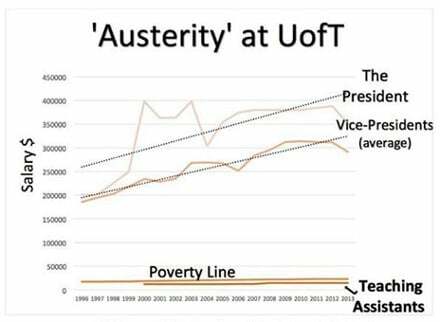 From universities to the public service, from healthcare to municipal services, the Ontario Liberal austerity regime has now lasted longer than Mike Harris’ time in office. Their approach has usually been different from the frontal assault of the Harris years. The Liberal government, especially under Wynne, has been adept at carrying out austerity by isolating potential struggles. Cuts and tough bargaining are directed against one sector of the public service, while others are temporarily left alone, to suffer under a slow strangulation of funds. When it comes to revenue problems, the Liberals are happy to blame the lack of federal transfers on the Harper Tories. But this is only half the story. The Liberals have repeatedly cut the corporate tax rate, have written off $1.4-billion in owed corporate taxes, and wasted billions on privatized “P3” hospital construction. The gas plant scandal cost the province a billion dollars, while the Ornge air ambulance scandal is only the tip of the iceberg of large, steady salary increases for top management in public services – while frontline workers are getting squeezed, contracted out, and legislated back-to-work. Unwilling to tax the rich, or tax the corporations, or bring revenue-generating services under public control (like Highway 407 or the Beer Store), the Liberals are only looking for savings by cutting services and holding down wages. Their answer to everything is turning the screws on workers and when that doesn’t work, using heavy-handed legislation, like Bill 115 against the teachers. With labour battles plaguing every level of the education system, a parallel battle is taking place in healthcare. Essential service legislation and arbitration means Ontario’s hospitals have largely avoided major labour disruptions. But in all other healthcare sectors, government agencies and private healthcare companies are pushing workers to strike over the fundamentals. Poverty wages led to the SEIU home care workers strike at Red Cross in December 2013, and another PSW strike by OPSEU members in Renfrew County in September and October 2014. Only last month, healthcare workers represented by the Ontario Nurses’ Association went on strike at most of the province’s Community Care Access Centres. As more services and costs are downloaded onto municipalities from the province, municipal workers are also bearing the brunt of austerity. Eager to avoid strikes and lockouts, most municipal governments have cut costs by slashing services, like childcare, and contracting out services such as snow-clearing. But there have also been difficult strikes, like the one by Durham Region municipal workers against the employers’ effort to divide the local by targeting the minority of paramedics with major concessions. At the crossroads of municipal service and healthcare cuts, paramedics are facing particularly grim working conditions. The Liberal assault on the public sector is mirrored by policies that aid and abet what can only be described as a war on workers in the private sector. Low oil prices and a lower dollar may help the province’s manufacturing somewhat, but the reality is manufacturing (and food processing) has been decimated. The slashing of corporate tax rates has done nothing to offset the tens of thousands of jobs destroyed since the 2008 recession. Again and again, the Liberals have allowed corporations to run roughshod over workers and the towns they live in. Like Harper’s Tories, when the employers have the upper hand, it’s hands off. When Heinz decided to abandon Leamington so people like Warren Buffet – the 3rd richest person in the world – could collect bigger dividends, no effort was made to stop it, broker a new buyer, or create the legal and financial space for a cooperative to be built. In London, Kellogg’s was allowed to shut down its unionized factory despite the province handing $4.5-million to the corporation to revamp its non-union Belleville factory only two years earlier. In Toronto, workers at Crown Holdings, a factory which produces beer cans, have been on strike for 18 months battling two tier wages and the use of scab labour. The Liberals are happy to let them stay out. But when workers exercise real power, like Ontario teachers or Toronto transit workers, their rights are stripped away. The Ontario Liberals have successfully appealed a court ruling which knocked down laws against agricultural worker unionization. Meanwhile, the Workplace Safety and Insurance Board continues to deny help to workers most in need while the WSIB management continues to rake in huge salaries. Until policies are changed to collect revenues on those who can afford to pay – corporations and the rich – the Ontario Liberals will continue to push for concessions from workers, rolling back the gains that generations of Ontario workers fought for. This won’t happen without a fight and until now, the battles of workers in Ontario have been too fragmented. Where real successes have happened, like the fight for a higher minimum wage, labour has come together and bridged the gap between union and non-union workers through on-the-ground activism. The first step now is to hit the picket lines at the universities and with striking Steelworkers at Crown Holdings. There are plenty of students and striking TAs who will take on the #BottlesNotCans campaign. Bringing together these strikes with the burgeoning OPS contract fight, and showing up at OPSEU’s numerous rallies and info pickets, Ontario workers can begin to build some real solidarity and power capable of taking on the Liberals. David Bush and Doug Nesbitt are editors at RankandFile.ca , where this article first appeared.